Irish Around The Bend is the community service arm of the Notre Dame Football program. Irish Around The Bend is focused on serving and helping those in the South Bend community and Michiana region. The Fighting Irish players and coaches are committed to giving back and making a difference in the lives of others – from elementary students to senior citizens. They want to proactively engage with the community. Speaking at events, helping with service projects or signing autographs, Irish Around The Bend knows no bounds. The program aims to positively impact any group in the community that seeks Notre Dame’s support. Hospitals, elementary schools, youth leagues, church groups – there is hardly a group the Irish will not make an effort to visit or an event they will not participate in, so long as it is within NCAA compliance guidelines. Irish Around the Bend centers around three of head coach Brian Kelly’s Five Pillars for Notre Dame Football – intellectual, spiritual and social. The Fighting Irish also work closely with associate athletic director Mike Harrity to support the events within the Student Welfare & Development office. Irish Around the Bend is about being other-centered. It’s reaching out. It’s helping the community. It’s making a difference in someone else’s life. It’s about student-athletes developing into well-rounded individuals. It’s about the love and care in one’s heart to do for others. And it’s about the players and coaches in the Notre Dame football program doing anything they can to better the lives of those around them. December, 2015. The Notre Dame Football Program and Kelly Cares have partnered for several years to offer the opportunity to local youth to Shop-With-A-Player as Christmas approaches. This is an incredibly rewarding event for the players and kids involved! Representatives from Notre Dame Security Police and the Indiana State Police choose a deserving local school district each year to reward with a field trip to Notre Dame. The kids have no idea why they are going to Notre Dame, just that they are going for a program. The kids are ushered into the team meeting room and get quite a thrill when Coach Brian Kelly enters to greet them to campus. Coach goes on to explain that, with Christmas coming they should do some shopping and they probably need some help. Enter the Notre Dame Football Players and the excitement and amazement in the kid’s eyes is priceless as they get partnered up with a current football player. On buses, donated by Royal Excursion, a full police unit escorts the team and kids to Meijer where Kelly Cares Foundation issues each of the 115 kids a $100 gift card to go do some shopping! At times its hard to tell who is having more fun between the kids or the players. Following the shopping spree, the group heads lunch. Papa Vino’s Italian Kitchen, graciously donates the meals for the kids and serves all the food the group can eat! This incredible event, born of Coach Brian & Paqui Kelly’s tremendous generosity provides some magical moments as the spirit of Christmas is strengthened for some very deserving area kids. December, 2015. The University of Notre Dame and Notre Dame Football attract attention across country and around the world. The attention is well-deserved, but for the players on the football team it’s not a one-way street. The team had a chance to support some great causes while in Arizona at the Fiesta Bowl this past December. Malik Zaire was a featured speaker at the Fiesta Bowl Fellowship of Christian Athlete’s Annual Breakfast in front of more than 1,400 people including 21 fellow teammates. Malik, very candidly, spoke about understanding that God has a plan for us all regardless of what we believe to be should happen. With great passion and eloquence, Malik explained how he came to this realization as he dealt with injury this season. As always, Notre Dame fans can be proud of the way Malik and his teammates represented the program and the University in front of a great crowd! Malik Zaire, Josh Barajas, Asmar Bilal, Scott Daly, Micah Dew-Treadway, Lincoln Feist, Jay Hayes, Nolan Henry, Tyler Newsome, Drew Recker, Robbie Regan, Jeff Riney, Trevor Ruhland, Hunter Smith, Devyn Spruell, Elijah Taylor, Jimmy Thompson, Brandon Tiassum, Jerry Tillery, Montgomery VanGorder, and Nic Weishar. Montgomery VanGorder, Brandon Wimbush, Tristen Hoge, Chris Finke, Jimmy Thompson, Mykelti Williams, Tyler Newsome, Ashton White, Drew Recker, Travis Allen, Scott Daly, Hunter Smith, Nic Weishar, Miles Boykin, Jeff Riney, Josh Anderson, Eamon McOsker, Jay Hayes, Jerry Tillery, Corey Robinson. December, 2015. 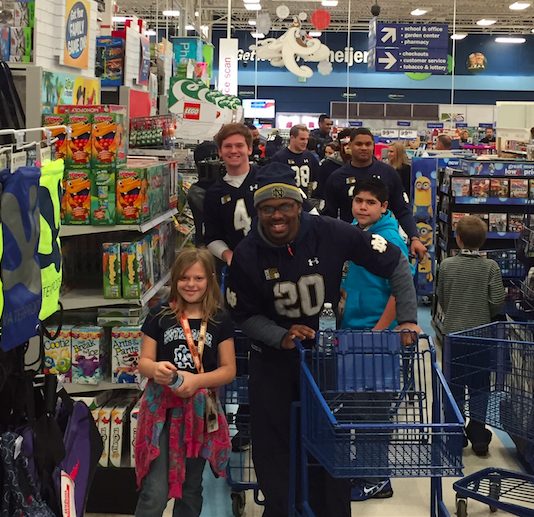 Notre Dame Football Players know a thing or two about community service opportunities involving escorting some kids on shopping trips! The Tempe IKEA provided a great venue for our players to spend a little time with some deserving kids and their families at the Fiesta Bowl Build-A-Bed Event. The Save the Family organization has helped many families find housing and provide a stable home life and IKEA chipped in to help provide some kids with their first ever bed! Twenty Notre Dame Football Players were paired with kids to help them pick out some bedding materials and then, quite frankly, build a bed! It turns out that some guy s are a little handier than others, but they all did a great job using their free time to make some dreams come true in Arizona! October, 2015. The Notre Dame Football Family had the great opportunity to help make a wish come true for one of their biggest fans during the Navy game weekend. Jack Salmond is a 17-year old senior from Logan, Utah who wished to be a part of the Notre Dame Football Team for a game weekend. Accompanied by his parents Patty and Nyles and two of his sisters, Jack got to meet Coach Kelly, spend some time in meetings with the WR’s and attend practice on Thursday. Prior to the start of practice Thursday, Jack worked with the kickers to perfect his craft and nailed a FG in Notre Dame Stadium. Friday gave Jack and his family a chance to visit campus and eventually finish the day off on stage with the team at the Pep Rally followed by the team dinner. Gameday proved to be the most outstanding experience for Jack as he had the opportunity to walk with the team to the stadium, run out onto the field prior to kickoff and the culmination of the trip came when Jack got to be on the field with the team singing the alma-mater, arm-in-arm with the team… victorious! Thank for visiting us Jack! Here’s to you… our biggest fan in Logan, Utah! September, 2015. Focus on someone other than yourself! Some of the guys took some time on a Wednesday to head out to Memorial Hospital to visit with the kids in the pediatric unit. There was no special occasion, no event planned… this was just a way to put a smile on some faces! The guys represented Notre Dame Football just the way we have come to expect. They were friendly and personable, they told stories and asked questioned and created a bright spot in the day for some families in the hospital! September, 2015. International Dot Day was celebrated this past September. Some Notre Dame Football Players along with some Irish Rowers got involved with Perley Elementary School for the occasion. International Dot Day is a global celebration of creativity, courage and collaboration. The Dot is the story of a caring teacher who dares a doubting student to trust in her own abilities by being brave enough to “make her mark”. What begins with a small dot on a piece of paper becomes a breakthrough in confidence and courage. The guys had a chance to help the kids talk about making their mark and discovering everyone’s abilities! October 2015: The bye week is a time to rest and recover, but its also a great opportunity to bring joy and inspiration to the kids within the community! The entire Notre Dame Football Team joined Kelly Cares Foundation to spend time at the CAPS Fall Family Festival in Elkhart recently. Led by Brian and Paqui Kelly, the guys spent a few hours playing games, taking pictures, signing autographs and listening to a story or two, bringing smiles to some precious faces! Child And Parent Services is a nonprofit organization dedicated to the cause of ensuring that every child in Elkhart County has the benefit of safe, stable, nurturing relationships in their childhood. Through education, advocacy and intervention, CAPS works with others in the community to build strong families and safe environments. October 2015: To finish off the bye week, Nicky Baratti and Matthias Farley spent some time with the kids at a Pheasants Forever event. Pheasants Forever is dedicated to the conservation of pheasants, quail and other wildlife through habitat improvements, public awareness, education and land management policies and programs. Notre Dame Football players come from many different backgrounds, with many different interests… it adds to the experience and education that you can only get at the University of Notre Dame!